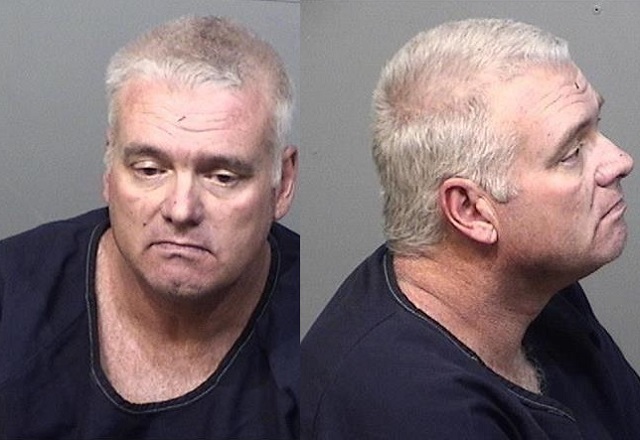 BREVARD COUNTY, Florida - Brevard County Sheriff's deputies arrested a man for allegedly hitting his wife in the head with a shotgun and punching his son just before 9 p.m. on Wednesday in Canaveral Groves, Florida. The wife and her children then fled the residence on Calamondin Avenue to a neighbor's house. When a deputy arrived, 50-year-old William Baldwin was seen holding a shotgun and took cover behind a tree. The deputy then went back to his patrol car and the Sheriff's Office set up a perimeter around Baldwin. While the perimeter was set up, Baldwin managed to fire one shot, but no deputy was injured. A Brevard County Sheriff's helicopter was dispatched to the scene in order to aid the deputies on the ground with Baldwin's arrest. Baldwin then surrendered to deputies. After he was in custody, deputies found a cache of guns and a bullet proof vest near Baldwin's location in the woods. Baldwin was charged with two counts of Aggravated Battery, Aggravated Assault, Displaying a Firearm During the Commission of a Felony, and Domestic Violence Battery. He was booked into the Brevard County Jail where his bond was set at $305,000.